Vesa Kaukonen at KK Superyachts sends news of a €1 million price cut on his listing for sale, the 41.2m motor yacht D’Angleterre II. Built by British yard WA Souter & Son, D'Angleterre II was delivered in 1986 and refitted in 2010. A bright, modern interior features whitewashed oak panelling, and she now has Wi-Fi internet access throughout. 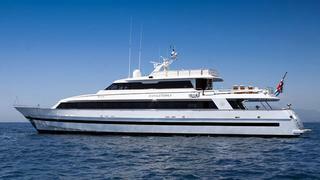 Her 10 guests are accommodated in five staterooms. The master suite has a television, DVD and his and hers bathroom with a shower and spa tub. There are a further two double staterooms and two twin cabins which can be converted into a single voluminous suite. All staterooms come with entertainment systems and full en suite bathroom facilities. She comes complete with a variety of superyacht toys, fishing equipment and snorkelling gear and has a range of 3,500 nautical miles powered by new 1,300hp Caterpillar engines installed in 2010. Lying in Nice, France, D’Angleterre II is down to €2.5 million.